Womens Fitness Magazine, June 2010. Feature: Plus Skin SOS. Gym Bag Essentials. 6 of the best . . Anti-agers. What they say? 4. 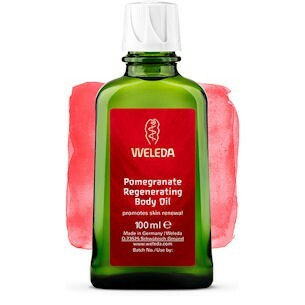 Weleda Pomegranate Regenerating Body Oil Restore skin and support cell renewal with this pomegranate seed oil, which is infused with antioxidants. Slather onto skin to boost elasticity and firmness.